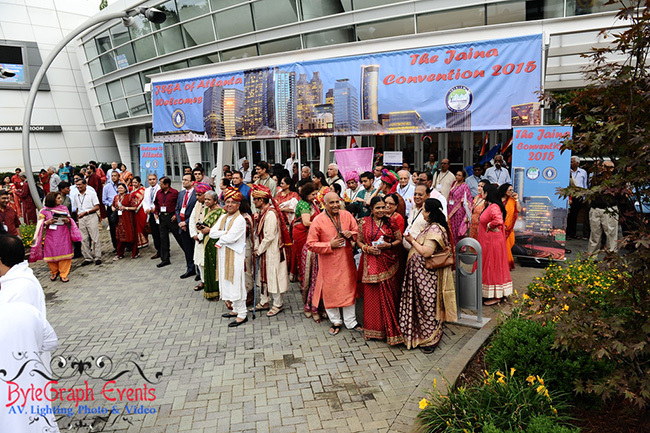 Atlanta, GA: The Federation of Jain Associations in North America (JAINA), the apex organization of Jains in the United States and Canada, with its mission of preserving and sharing the Jain way of life, hosted a spectacular four day convention on the 4th of July weekend, organized by the Jain Society of Greater Atlanta (JSGA) at the Georgia International Convention Center (GICC), in College Park, Georgia, very close to the world’s busiest airport. Over 4000 people attended. The Convention theme, appropriately titled “Ahimsa” (non-violence), found its rightful site in Atlanta, the birth place of Dr. Martin Luther King, Jr. 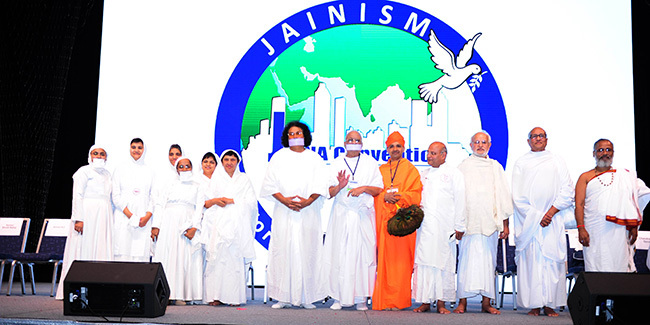 The Convention was graced by over 30 erudite Jain monks – nuns, scholars (from Indiaa s well as other nations including the US), leading social activists, distinguished professionals and patrons. The “swagatam” ceremony comprised of a welcome song composed by Indravadan Bhavsar followed by a fusion of classical and folk dances, showcasing a cross-country journey from the east to the west including items from Atlanta to Chicago to Southern California, interlaced with welcome messages by JAINA Board Members and conveners of this event. Two young dancers performed a zesty dance to “Jeenu jeenu ude re gulal Prabhuji tare mandiriye” and a skit P.K. presented by the Atlanta youngsters. At the behest of Mrs. Madhu Sheth, Viren Mayani had quickly organized a press conference to discuss the event, JAINA at large and the Convening entity the Jain Society of Greater Atlanta (JSGA). The conversation presenters were current JAINA President Ashok Domadia from San Francisco, Past President Sushil Jain, Shobha Vora also from San Francisco, Hemant Shah from Chicago and from Atlanta: Deepak Shah (JAINA Co Convener & past President of JSGA), Sameer Shah (Current JSGA President), Madhu Sheth (Past President of JSGA) and Santosh Kothari (Past JSGA Board Member). At the press conference convened by Madhu Sheth with help from Viren Mayani, host cityAtlanta’s Jain Center President and convention board member; Samir Shah informed all that for past eight months more than 300 people have been working tirelessly to make the convention memorable. The approximately 4000 registered raised $600,000 and an equal amount of funding was raised through other means. Mumbai based Classic Productions Director; Kamlesh Bhuptani’s artists’ regaled the attendees at the Raas-Ramzat program. The packed hall of guests, young and old, decked in colorful formal costumes formed circles and performed the high-energy garba and dandiya raas to popular Gujarati songs by noted singer Abhesinh Rathod, accompanied by Rinku Patel and Jayshri Khavadiya and ably supported by musicians Hitesh Bakdas, Jayanti Kabira and Kunal. Friday; the next day, began with the grand opening ceremony. Present were Hon. Nagesh Singh, India’s new Consul General to the southeastern US, UN Ambassador Andrew Young, Congressman John Lewis, Hon. Bucky Johnson; Mayor of Norcross, Mr. Nipun Mehta (a noted philanthropist), Mafatlal Patel of Patel Brothers (who donated all the food for preparations of 3 meals a day for 4000 attendees), as well as Atlanta’s R. K. Sehgal besides others known personalities. A grand procession commenced outside of GICCC enter in front of Springhill Suites. Ladies clad in fetching saris and carrying “kalashes” earthen pots marched in front. They were followed by a van and beautifully and imaginatively themed floats festooned with flower-garlands, and carrying the idol of Lord Mahavir. Hon., Consul General Nagesh Singh, in his address, read a message from PM Modi. “I am happy to learn that there are 71 Jain centers in North America. I am also pleased to note that the theme of this year’s convention is non-violence. I hope that this convention will emerge as an effective platform for the distinguished delegates to reflect on the teachings of Lord Mahavir and his eternal message of ahimsa,” he said. Ambassador Andrew Young spoke next. “We continue to redeem the soul of America from the triple evils of racism, war and poverty. I think we have made enough progress on racism and war but little or no progress in ending poverty in this nation or in much of the world. So the challenge is; that only non-violence is the answer. If people have jobs and food they are less likely to be violent,” he said. The final speaker, Nipun Mehta, the founder of Service Space, talked about humility as a virtue. The cultural program began with the final round of competition for JAINA’s Got Talent. The first group winners were: Anjal Jain and Shilpi and second group: Vineet Jain and Bela Gandhi. 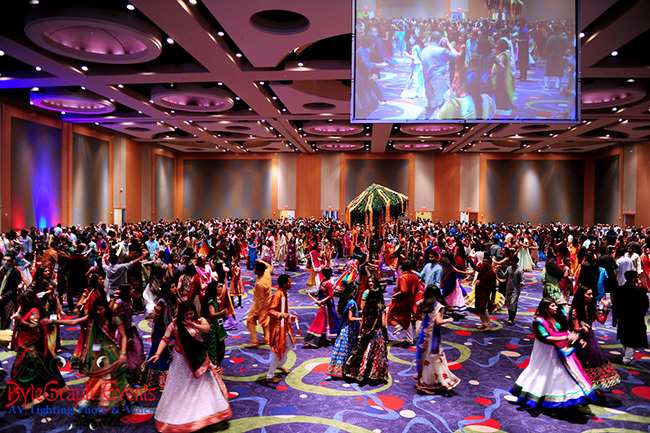 Atlanta’s “Jeenu Jeenu Garba” dance which won 2nd place, was perfomed by a group of 10 ladies: Neelima Kothari, Reema Ajmera, Ritu Dosi, Kamini Jain, Preeti Jain, Rashmi Jain, Ritu Jain, Shweta Jain, Sunita Peramaru and Rina. This dance was choreographed by NNKB’s Vasanta Chivukula and Mital Patel. The pre-recorded emcee voices of Reshma Shah and Seema Jain brought the cultural show to a great start by announcing: So Live, Let Live and Rock on! Sound and lights by AV Creations and the digital effects on the huge screen by Hitesh Shah, served as a fantastic backdrop. The first half of the show included presentations from all over the country: Maa Tujhe Salaam, Rind Posh Maal, Kay Je Jiv Ki Suno, Ayo re Dholna, Shubharambh, Jino jino ude re gulaal, Pani Da Rang, Aaja Nachle, and Girinar Stavan. The second half of the program primarily had presentations from Atlanta groups and dance academies. The second half began with a prayer to Lord Ganpati with the popular song: Deva Shree Ganesha. Then it was Mein Tera Hero, followed by Tune Maari entriyaan byKrutiDanceAcademy’s teenage students. After that was Senorita from Zindagi na milegi dobara film: This item was out of the ball park as it was contemporary and non-traditional fusion dance performed by young boys & girls. Choreographed byAtlanta’s proficient Bharatnatyam virtuoso Rifka Mayani, of the Tandav Themes Dance Academy & KSU’s instructor with the Program in Dance; it was a collaborative Bharat Natyam and a Latino flavored Spanish item. That was followed by a dance medley: Bezubban- overstating that you can take someone out of India, but certainly not the Indian out of him. A Mahek Dance Academy presentation of Radha on dance floor was popular as well. “Jai Ho” from the Oscar winning Slumdog Millionaire with music composed by the world famous, A. R. Rahman; also Choreographed by Rifka Mayani, was next. Early-teen girls presented a celebration of victory through ahimsa. Manwa Laage and Banke Titli, next, was also by Mahek Dance Academy had ladies perform a joyful dance with a backdrop of yellow butterflies hovering over an open and green meadow. Followed by A Town Down in which High School performers, who choreographed this dance, performed clad in white shirts, black pants and red bow ties. The next item was unique. “Our roots”: was a skit within a dance. This was followed by the high energy and much loved; Nagada dhol, by an energetic group of moms. The Grand Finale was the coming on stage by all the performers waving battery operated lights and swaying to the extremely popular and patriotic “India Wale” which was the dazzling finale. On Bollywood night, prior to Kumar Sanu’s performance, a small group of young students of Atlanta’s NNKB (Nritya Natya Kala Bharti), performed a dance on the “Upasarghar Stotra”, which was choreographed by Samta Savla. Mital Patel worked with the girls to embellish the performance. The remainder of the night celebrated the absolutely powerful and musically enlightening performance of 2009 Padmashree Kumar Sanu; one ofIndia’s most popular Bollywood playback singers. He is the recipient of Filmfare Best Playback Singer Award for five consecutive years. Accompanied by two female singers and a small but powerful group of musicians, he regaled the packed to capacity audience, with over three hours of his choicest vintage songs from his wide repertoire. Some of the hits he sang included: Ek Ladki ko dekha, Do dil mil rahe hain, Sasson ki zaroorat hai, Taza taza kali khili hai, Aaj hamare dil mein, and duets such as: Dil hai ke manta nahi, Dheere dheere se meri Zindagi mein aana, Sochenge tumhe pyaar, Jab koi baat bigad jaye and many more. He showed his singing prowess by singing a Rafi song, Hui sham unka khyaal aagayaand a Mukesh hit: Aansoo bhari hai. During the program, one of the most prestigious JAINA awards; the JAINA Ratna (Jewel) was presented to Dilip V. Shah of Philadelphia, PA for his outstanding commitment and dedication to JAINA for the past many decades. The convention was completely pictorially covered by Bytegraph and the sound & lights by Sandeep Savla’s AV Creation’s added a great flavor. Bravo to the logistics Director and Convention Board Member, Vijay Kothari, for flawless management of the facilities, to Manish Shah for fantastic entertainment programs, to BAPS Shayona for the catering, to Madhu Sheth for securing Ambassador Young and Congressman Lewis as Honored Guests, to Deepak Shah and Sameer Shah for their vision, complete programming and titanic fundraising, and kudos to the countless others (more than 300) who served the event with complete humility and pride, for the occasion to be a mighty success, which it certainly turned out to be! Atlantais home to some 550 Jain families some of whom have been here for over five decades. They have been practicing Jain traditions and passing it on, beginning with home grown pathshala classes to now having their own facility, by funding, designing and constructing their own Jain Center; JSGA in Norcross. Worst person & the award to be given to the only GUNVANT SHAH. The worst ever JAINA convention. Should have a new team to run JAINA, FIRE the people who messed up this 2017 convention which made SAD to 95 % ++++ people & also the speakers & scholars who came and will never come again because of the RUDENESS of the management. HOPE YOU ALL GET OUT FROM YOUR POSITION IMMEDIATELY, so the others old can bring PRIDE back.